Have you ever just stared at your child from a distance and thought: “Am I doing this all right”? Perhaps you’re about to rip your hair out and that can’t help but wonder: “What am I doing wrong”? Or maybe you’ve watched them sleep thinking: “But what more can I do for them”? In spite of the fact that we are 101% sure of the degree if love we have our children no matter how bad a particular day is going, we doubt without fail whether or not they are even happy children who actually feel loved, or if in fact you are managing to be aware of their own love language and demonstrating that sense of love accordingly. 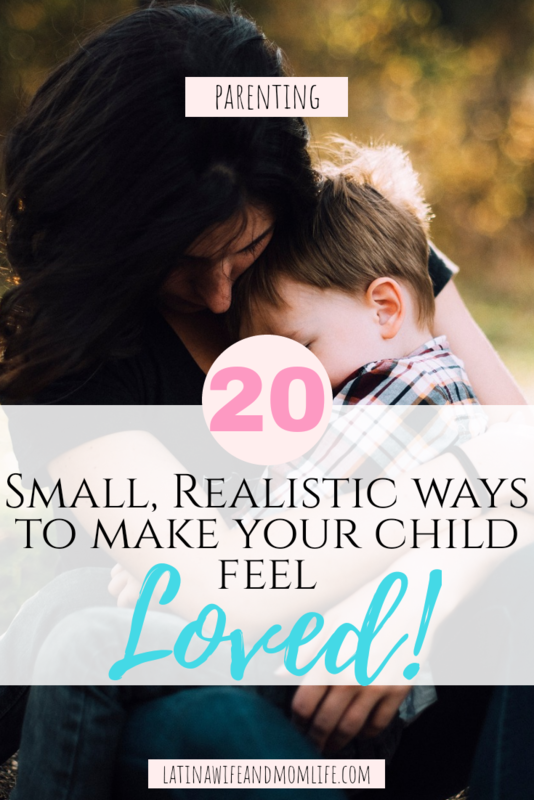 If you have contemplated these thoughts or similar doubts, today you will take with you small, realistic ways to consistently make your child feel just how important she is to you! I think this is one of the cutest, most affectionate gestures that makes a child smile with delight! Sometimes my 3 yr old daughter will stare at me and smile, and I proceed to play nose kisses. Let your child feel that your are actually attentive to him and not only distracted with the phone or your chores. Peek out of the kitchen, say “hey buddy”, blow him a kiss and give a wink and smile. After you read a book, or when your getting ready for bed, or like some cuddle time in the morning when y’all just woke up. Surprise your child with a random tickle fight. Don’t forget to let her do the same to you! As a former pre-k teacher and as a Momma, I have concluded that this is THEE favorite kind of contact they like and enjoy. They just love, love LOVE this! My daughter loves it so much, she will pretend to be sick in order for me to do it. Don’t get me wrong haha, I don’t do it only when she us sick. And when I do it, she never wants me to stop! It does not matter if your hands are soaked and covered with soap when your child approaches you to “answer the phone” while handing you a toy block in the middle of you washing the dishes. You must dry your hands, answer that phone call and proceed to enhance her creativity by offering to play house, or whatever else will amuse her! Because clearly when your child starts to interrupt you, it’s time she needs you to play with her. At least before she recurs to misbehavior. We like, and in fact expect, our children to have listening ears, right? Have you had listening ears? Or do you just linger over the kitchen counter checking your social media. 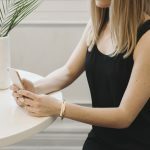 I have failed at this and am ashamed of all the things I have ever missed out on or misunderstood because I was distracted with my phone, like not noticing my child talking to me, or not seeing my baby trying to turn on a toy, not seeing something my husband wanted me to see when we were on the road, or even disciplining my daughter for something she didn’t even do and lots more moments that I can’t take back. If you don’t put your phone down, this is what happens. You miss out, and so do they. Your days with them are never coming back again once they’re gone. Don’t let them go! “Hey buddy, tonight for dinner we can have A or B, which sounds better to you”? Only you know what thrills or amuses your child to no end. For my daughter, for example, it’s an ice-cream scoop with mommy on our front steps or a trip to the park. These are things they don’t get every day, but sudden treat is always so lovely to them. Did your child wake up before your other one? Have some special bonding time just the 2 of you! Is daddy going somewhere, have him take one while you do something with the other. Want to do something extra special? Extend bed time! This is a big one Momma. No matter how young your child is, never think that he’s to little to realize or remember, etc. The youngest years are the most ideal trust building stage and if you can not stay consistent on the little things, they will not count on you for the big things by the time you want them to when they’re much older. This is so so SO important! As important as it is to kiss your child goodnight even if they are already asleep. My daughter was so little once when I promised to take her to Save Mart for a piece of cake, and though I had forgotten she didn’t. She could barely talk then, and still managed to tell me about the cake. Other times, she has been the one to forget whatever it was she wanted, but I have never taken advantage of that. I remind her what I told her proceed to do it. My intention is to establish and build trust. I want my children to trust me on the big things one day as they do now with the little things. Read, read and read some more. Create an appealing comfy nook where you can have that special time together. Ever since I made mine (which i’ve done like 4 yimes!) My babies are literally always reading books and every time I pass by, they’re like “sit down, sit down. Read it, read it”. You don’t need to over praise every little thing but it is important to address the good things that they do so that that behavior can be encouraged more as well as building up their sense of worth and self esteem. I don’t know about you but I love hearing someone talk about me. I think it is extra special to a child to get to spend time with mom hearing stories and things about when they were little! To begin with, the honorable thing to do as a gracious Wife is receive your husband not with comments about the bills, or something that needs fixed, or how bad your day was, etc. 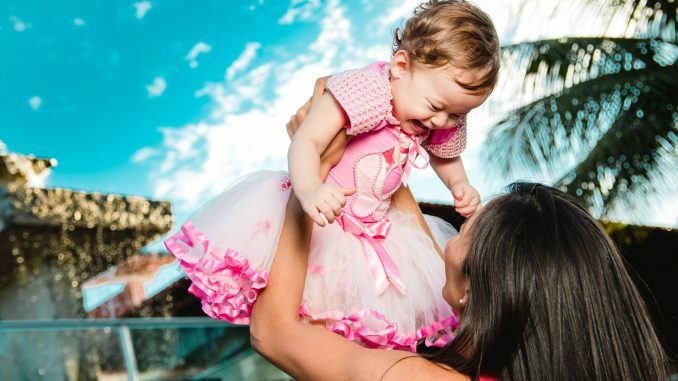 First elaborate on the good things, and make sure your child hears you saying nice things about the good she did that day! 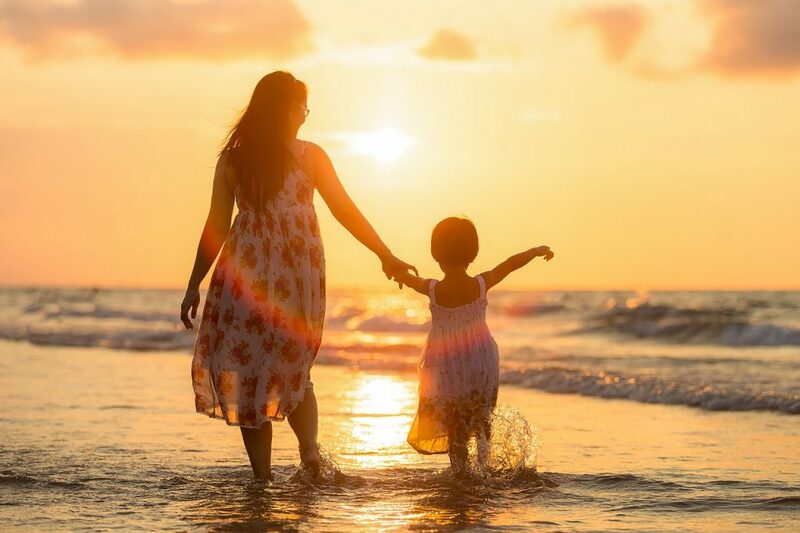 Especially if they are the working parent, it is imperative to find, make and invest quality time with your child, and them and that time a priority. THIS, is the ultimate act of love for a child! Raising him in a happy home where he can feel that sense of security and stability. The ideal example of what love should look like in a family. We’ve all heard it or said it before: “Oh your fine, baby girl. You’re ok. Look ‘so and so’ is not crying”. I’m not the parent to make a big deal when something happens. Like if my child trips I don’t jump up to run over to him and pick him up, I only encourage him to pick himself up. However if he is hurt and needs a hug, it’s ok. Mommy is there for that. If your child is upset over…whatever it is, she has a right to take the time she needs to embrace her feelings. Don’t we all? Just like we feel overwhelmed and cry sometimes or feel scared and worried about things, so do our children. If we cry, much more can they! No matter how much you for or with your child, a consistency of actually telling your child you love them goes a really long way! I didn’t have the ideal mother growing up and was pretty much raised by my Dad, but if there were one thing my mother gave me that I still hold close and carry out with my own babies, is making sure that not a day goes by that I don’t tell them I love them. 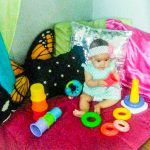 This post has summarized a list of simple practices that can work for all children in general. However just like every person is different, so are children as well as their love language. 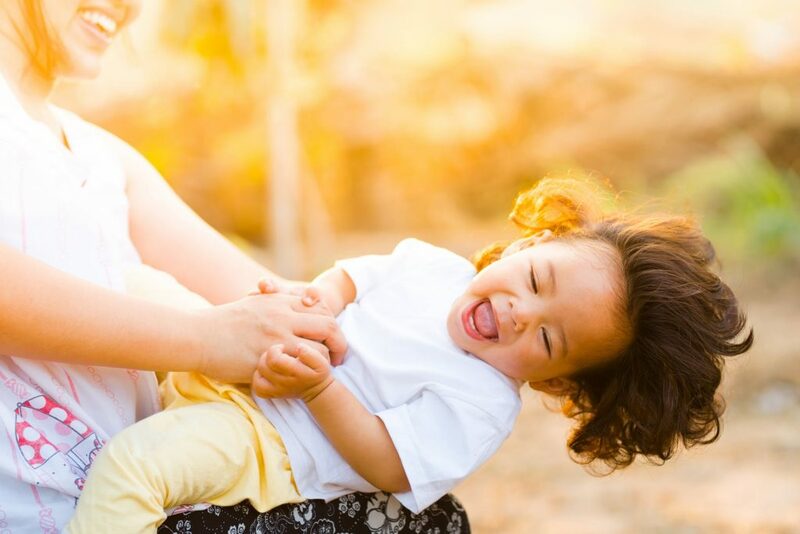 So we have to ask ourselves: “Are we loving the way our children can receive, interpret and experience it, or are we loving the way that we think they do”? My son does not interpret love the way my daughter does. My daughter for example, loves laugh and play. She likes me to run around and be wild with her. My son on the other hand, likes to be touched and held. He likes hugs and kisses. What is your child’s love language? What other ways can you enhance that experience for him to suite his particular needs and wants? I have a handy printable designed specially for my newsletter members! 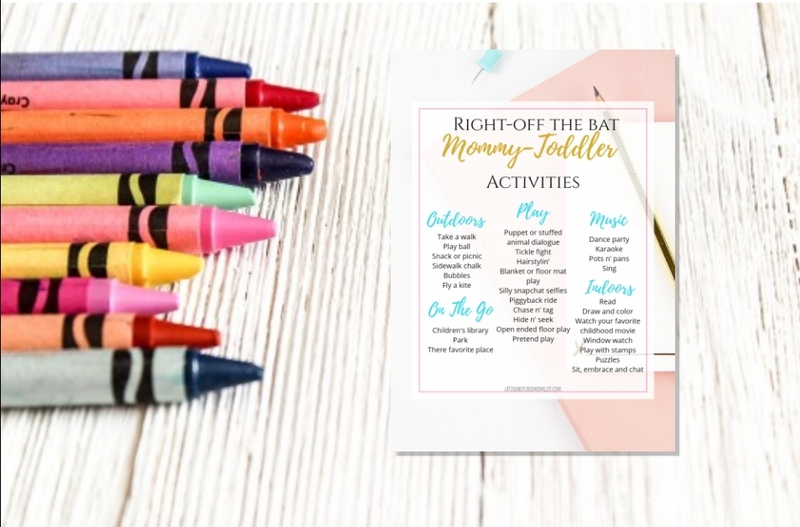 These right-off-the-bat play ideas are super realistic for you while highly appealing to toddlers! Simply subscribe below and you will immediatly recieve the password to the library that contains this and all free files currently available.